I hate to say it, but the party’s over. And in our efforts to remember to start writing 2013 on everything we’re probably already starting to forget all about those pesky resolutions we made way back (last night). I wonder if you might have tried any or all of the exercises I mentioned before the champagne started flowing. Your swing – how does it look? Are you pulling it off about the same each time? What differences did you notice when you started observing yourself in the mirror? How are you compensating for those extra pounds? What is it costing you? Speed? Accuracy? Consistency? All of the above? And, by the way, have you been to the driving range? Either indoor or outdoor (if you’re lucky enough to live someplace warm)? How long is it taking before you HAVE TO take a rest, grab that bottle of water or just take a little breather? Have you been making at least a mental note of your yards? Do things start out strong then dwindle? Stay the same but are continuously unimpressive? Look, blame it on whatever you want but at this time of year especially the problem is likely to have a lot more to do with the golfer than with the golfer’s skill. Lose fat and you’ll gain yards. 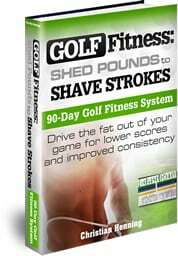 Or, to put it another way: “Shed Pounds to Shave Strokes.” That is the name of my program and it can permanently change your game and give you more yards with fewer strokes in a very short time. Now that your resolution to improve your game is firm, it’s time to set some goals. In the next three months, what do you want to improve and by how much? Be reasonable, but make sure your goal will present you with a challenge. >>>#4. Commit to the full 90 days. your gym membership. Use it. It’ll get you further than circuit training and it’ll cost a fraction of what you’d spend going to a gym. I almost forgot to mention, this is a home-based program. No gym. No expensive equipment. But yet, you can still do it in the gym if you want. If you have a few basic things like some dumbbells and a weight bench chances are you won’t have to invest in anything much beyond the e-book. And if you do, you can probably find everything you need on the cheap. Forget about status. Save that for the Golf course. Bottom line: I’m asking you for 90 days. And in those 90 days I will either get you to your goal or provide you with enough success habits to get there on your own. You will know how to exercise to lose the fat. You will know how to exercise to stay lean and build upon an alreadystrong golfing skills set. You will feel better and notice changes even in your daily routines. When you see results, you want to see more. You’re willing to DO more. time and energy on things that don’t. You need to start seeing yourself in the same light and keep your focus on not just fitness, but GOLF fitness. This is what I’m offering: a real education about what you need to succeed in your chosen sport. But I’ve taken enough of your time for one day. Tomorrow things get really specific. Not only is it an issue of “you get what you pay for,” it’s an issue of whether or not someone else’s advice will get you where you want to be. I stand behind my programs and I also have your back. I’m not just trying to sell you information and run. I make sure you have every opportunity to succeed and I make myself part of that process beyond the program itself. I’ll have more to say about that tomorrow. How To: 3 Steps to Assessing Your GameWhat Equipment Do You Need To Lose Fat?